I grow several hydrangea bushes in my gardens. Three of these produce flowers that dry well. When the petals thicken, and take on a greenish sheen, it’s time to cut them. I snip off a piece leaving six to eight inches of stem, vase bunches in a few inches of water, and set them on the top of my kitchen hutch. I occasionally check the water level, but other than that, I don’t do anything more. A few will wilt, but a good three-quarters dry in a few weeks. Dried hydrangeas are lovely, the colors reminiscent of watercolors; pink, lavender and blues swirled together to create a hazy spring-like glow. The trouble is, in a few months the colors will begin to fade to a weary beige. This year I came up with a solution. In the past, to keep dried flowers and protect the delicate petals, I have sprayed them with hair spray. Why couldn’t I add a bit of acrylic paint to the hair spray and get a double advantage when I apply the protective film? I bought a pump-bottle hair spray I knew was long-lasting and had a nice fragrance. (Aussie Brand) Your wreath will remind you of a hair salon for a few weeks so be sure the smell of the hair spray you choose is not something you find repellent. An unscented spray will also work. Next, I divided the spray into two jars. Into these jars I added cobalt blue acrylic paint, a few drops will do, and in the second jar a mix of cobalt blue/alizarin crimson paint to make a lavender. I use Golden Taklon Soft Body acrylic, but I think any brand that has decent coverage, and is not too thick, would work. Tube acrylics are not an option for this. 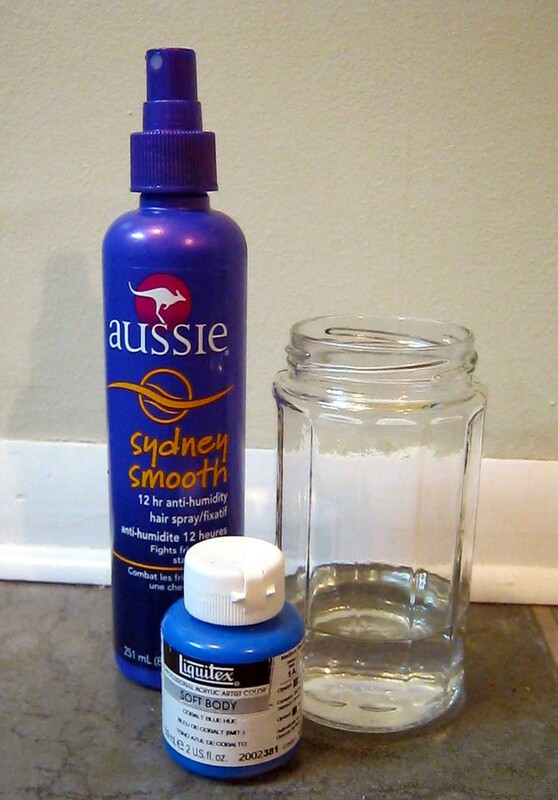 I put the lid on the jar and shook for about thirty seconds to make sure hair spray and paint were incorporated. The next step was to pour the paint/hair spray mixture back into the pump bottle (Don’t use a recycled spray bottle, such as Windex, etc. 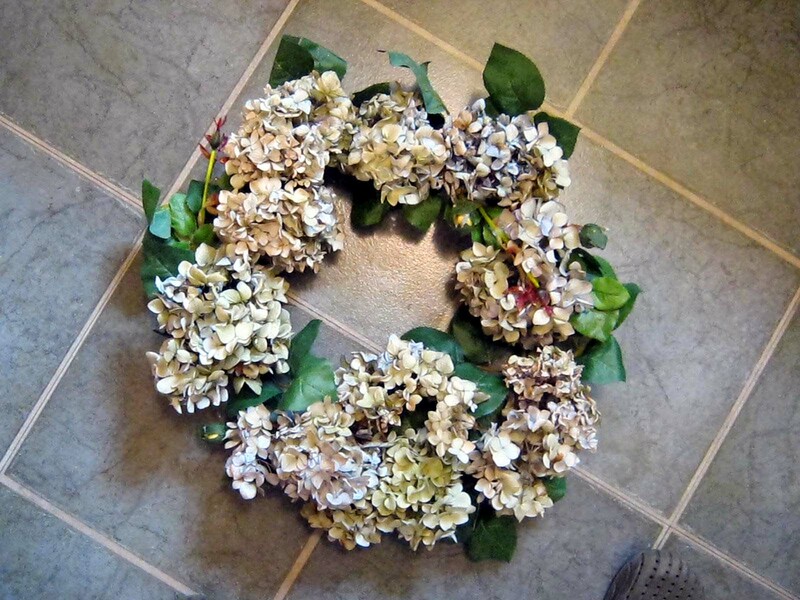 the spray is too heavy and the droplets very large) I covered the garage floor with newspaper and laid my dried hydrangeas out in a single layer. Away I sprayed with the Cobalt Blue mix. Eureka! The thin mist of tinted hair spray worked as I intended, enhancing the colors already present on the petals. Next I added a bit of Cobalt Blue and Alizarin Crimson to the second mix, a soft lavender/pink. I sprayed a quick coat of this on the flowers. Yes…they blended perfectly. Within a day they were dry. 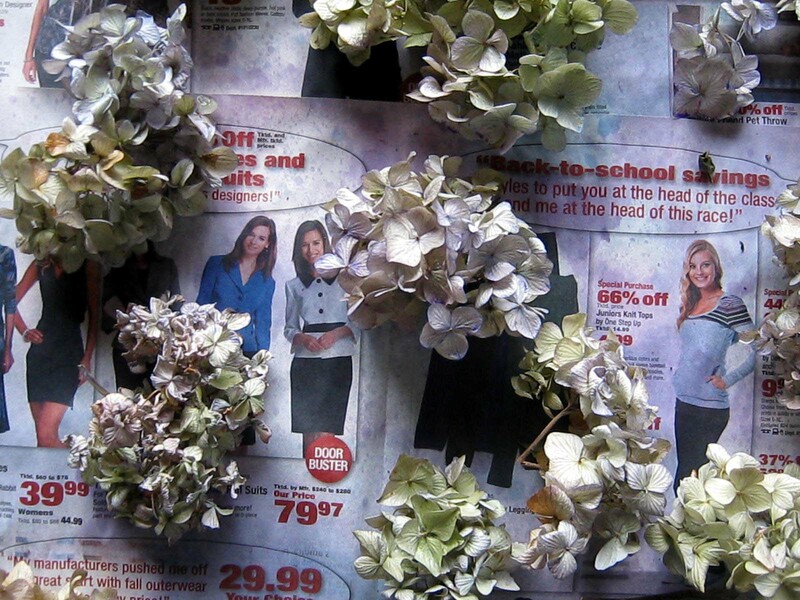 I hot glued the hydrangeas to a wreath and hung it on the wall. 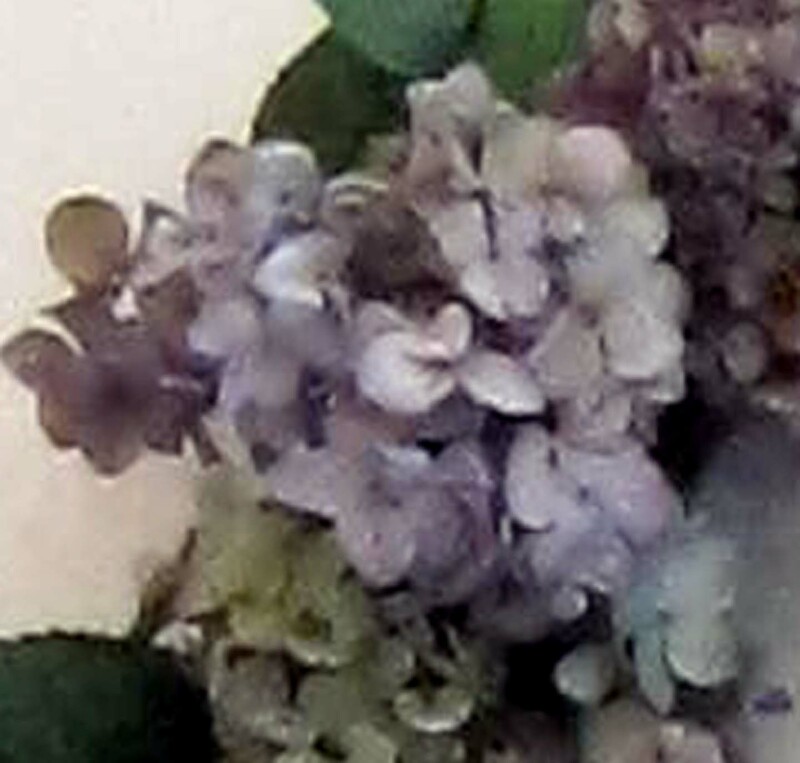 The natural colors will still begin to fade at some point, as all dried flowers tend to do, but this year the enhancement of the acrylics will keep them looking vibrant for a while longer.